I love living in Minnesota, particularly the Twin Cities of Minneapolis and Saint Paul. I grew up in Golden Valley, a Minneapolis suburb, lived in Saint Paul for many years, and then moved to South Minneapolis in February of 2006. People who can’t stand cold winters might think me crazy, but there are not very many other places that I would rather live. 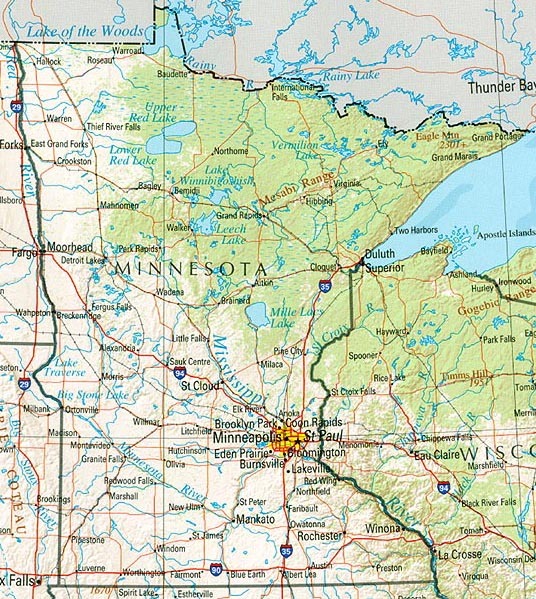 One of the reasons that I wanted to set Arcana in Minnesota is that so much of our media, particularly film but also literature, is set out on the coasts in places like New York City and Los Angeles. The only Midwestern city that has much presence in film or literature is Chicago, which has a culture quite different from the upper Midwest. I figured that if an author who loved living in New York City could write a novel filled with New York landmarks and trivia I could do the same for the Twin Cities and surrounding area. While this exposition was not part of the first draft of the story, I think that it adds depth and background to the narrative that would otherwise be missing. In order to expand that sense further, I thought it would be a neat idea to put together this page showing pictures of the various places that are mentioned in Arcana to help readers get a better picture of what these places really look like. Because of the time involved tracking down photos and writing up short histories of these places this will remain a work in progress until all of the chapters are represented. To view the places associated with each chapter you can click on the Subpage listing for that chapter on the right side of the page. As I track down pictures and finish my write-ups I will add more chapters to the list.